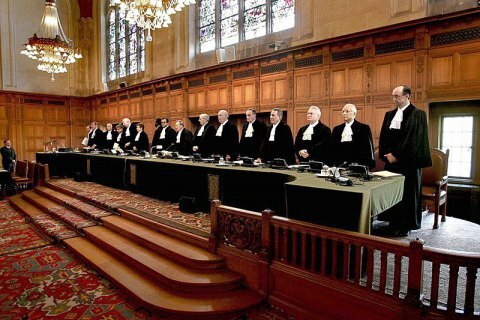 The UN International Court of Justice will decide in favour of Ukraine, the diplomats hope. Ukraine's Deputy Foreign Minister Olena Zerkal has said she is convinced that the UN International Court of Justice will decide in favour of Ukraine in the consideration of a claim against the Russian Federation. "We are convinced that we will win this thing. There is every reason to believe that the court will issue a positive decision because we are not asking for anything special that would go beyond the competence of this court and we are not asking for anything that goes beyond the performance of a country that is a signatory to international conventions," said Zerkal. Responding to a question regarding the timing of such a decision, the deputy minister said that it would depend on how "the court procedurally determines the time they need to make a decision." "In the case of Georgia it was fairly fast - they have ruled on provisional measures within three weeks. Given that we question the implementation of two conventions, it may take a little longer," she explained. Zerkal stressed that the impending decisions of the court are binding for all parties. "Russia, of course, can do whatever it sees fit, even to call white black. For Ukraine, this will be the first legal confirmation of the Russian obligations to comply with both Conventions and the Court's decision. The violation of these obligations will assign Russia to another club – the club of countries which do not honour any international law or a court decision. And that's quite another kind of relations," she said. Ukraine has accused Russia of violations of the International Convention for the Suppression of the Financing of Terrorism of 9 December 1999, and the International Convention on the Elimination of All Forms of Racial Discrimination of 21 December 1965. Previously, legal experts would say that the decision in favour of Ukraine could legally fix the financing of terrorism and the facts of racial discrimination and provide for a series of compensations to victims, but would not resolve the problems of Russia's responsibility for the armed aggression in eastern Ukraine and Crimea. The Hague tribunal has begun scrutinizing the evidence of Russia's military crimes in Donbas in April last year. Russia in The Hague: Ukraine had "coup" and "civil war"